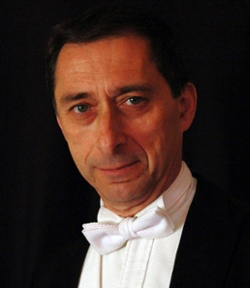 William Bausano: Bio & Choral Music | Santa Barbara Music Publishing, Inc.
William Bausano is the Director of Choral Activities and Professor of Music at Miami University, He is the conductor of the Chamber Singers and Choraliers, and teaches voice and choral music courses. Dr. Bausano is a graduate of Northern Michigan University and the University of Southern California where he completed the Doctor of Musical Arts degree in Choral Conducting. His choirs have appeared regularly at professional conferences of the American Choral Directors Association and the Music Educators National Conference. Dr. Bausano’s musical pursuits have taken him throughout the United States and to Europe, South America, and Australia, performing in such cities as Athens, Florence, Helsinki, Moscow, Paris, Porto Alegre, Sydney, and Venice. He is also active as a baritone soloist, performing in oratorios and operas. In recent years Dr. Bausano has conducted world premiers of commissioned choral works by composers Chen Yi, Ola Gjeilo, Adolpus Hailstork, Joan Szymko, and Corrado Margutti, and Howard Helvey. His choral editions and arrangements are published by Colla Voce Music, Lorenz Corporation, Mark Foster Music, Shawnee Press, Treble Clef Music Press, and others. Prior to his appointment at Miami University he taught vocal music in the public schools in Los Angeles, and at Los Angeles Valley College. Dr. Bausano also conducts the Holy Trinity Episcopal Church Choir in Oxford. He is a founding member, past president, and Honorary Life Member of the National Collegiate Choral Organization. William Bausano has 1 titles published with Santa Barbara.